This is really cool. This is a leaf from a manuscript called Sukkat David. It's a notebook of David Franco Mendes, 18th century Hebrew writer and poet of Amsterdam. He is best known (to me, anyway) for being a close friend and disciple of Rabbi Moshe Haim Luzzatto when the latter lived in Amsterdam, and also for being one of the original Meassefim, a contributor to the first periodical of the Berlin Haskalah, where he contributed poems and biographical articles about gedolei yisrael. This excerpt is from an essay where he is trying to prove that the correct pronunciation of the קמץ is that of the Sephardim (A) and not the Ashkenazim. He offers several proofs, one of which is the way names like Adam and Abraham are transliterated in Greek letters in Josephus, which he points out, is from the last days of the Temple. Being this old, this is a proof that the A pronunciation is correct, while the pronunciation of the Ashkenazim as - wait for it - Odam and Afroom is not. Check out the other proofs. It's on page 29. I learned of this page in Berger, Shlomo. "Remus, Romulus and Sephardic Jews in Amsterdam." 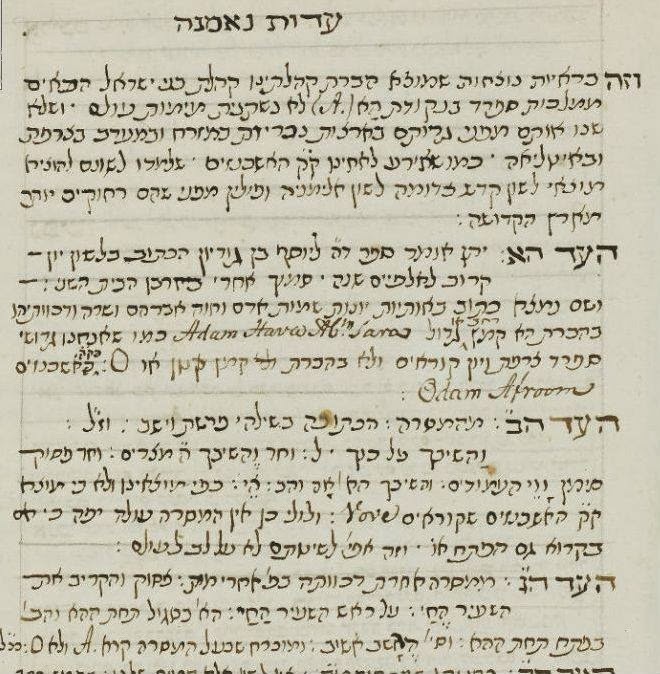 Studia Rosenthaliana (1992): 38-45, but finally the manuscript has actually been digitized by the amazing Ets Haim Library. Much valuable material can be gleaned from this manuscript and the wealth of others on this site.